Slavonice (Czech pronunciation: [ˈslavoɲɪtsɛ]; German: Zlabings) is a town situated in the southwest of Moravia near the border with South Bohemia, Czech Republic, about a kilometre from the Austrian border, with about 2,700 inhabitants. 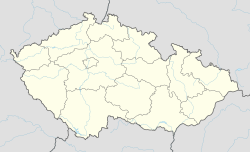 While historically the town belongs to Moravia, it is now part of the South Bohemian Region. The town has a traditional medieval renaissance city centre with sgraffito covered buildings dating from the 14th to 16th centuries, the oldest dating to 1545. The sgraffito are the second oldest in the Czech Republic, with older existing only in Prague from 1544. The renaissance character of the town is due to a period of extreme wealth in the 14th to 16th century when Slavonice was an important town on the route from Prague to Vienna. When the route was relocated to the north, passing through Znojmo the town's source of wealth dried up as the local farming and forestry activities could never generate enough income. The town is therefore very much preserved in its renaissance look. The town and the surrounding countryside were lightly fortified in the period leading up to the Second World War. Some of these small bunker complexes have been repaired and refurbished, with mock battles of Wehrmacht and Czechoslovak forces taking place in summer. The area and defences were never used against the Third Reich as the town and region had to be surrendered to the Third Reich following the Munich Agreement. The original German-speaking population was expelled in June 1945 following the Second World War. Being so close to the Austrian border, Slavonice was heavily affected by the creation of the Iron Curtain during the period of communism. The nearby hamlet of Maříž was emptied of its inhabitants during the communist era in an effort to prevent people from living anywhere near the border with non-Communist Austria (the current inhabitants could stay but no new residents could move in and property could not be sold or inherited). After the Velvet Revolution and the fall of communism, Maříž was recolonized by ceramics artists, and Slavonice has once again become a popular destination for Czech tourists and artists. Many small galleries have sprung up as a result of the work of artists and workshops in Slavonice. Slavonice is very popular not only for its preserved renaissance town centre but also for the underground tunnel system dating back to the 12th century and surrounding countryside, which is unspoiled by industry. The region is popular with cyclists who can take advantage of a large area known as Bohemian Canada Česká Kanada, an area that was inaccessible under communism but that now offers a pleasant ride through pine and spruce forests on narrow border-patrol roads where there is very limited car traffic. The town applied for UNESCO World Heritage protection seeking to become a partner to the nearby UNESCO protected Telč but withdrew its application before a decision was reached. The town was used by Jaromil Jireš as a location for his film Valerie and Her Week of Wonders (1970), based on a 1932 Valerie and Her Week of Wonders by Vítězslav Nezval. Wikimedia Commons has media related to Slavonice. Wikivoyage has a travel guide for Slavonice.